Biology in Science Fiction: Dinosaurs on a Spaceship: Not enough feathers! Dinosaurs on a Spaceship: Not enough feathers! A couple of weeks ago the Doctor Who episode "Dinosaurs on a Spaceship" delivered just what the episode title promised: dinosaurs, on a spaceship. Of course there was much more to the story than that, and the episode had a mix of the silly (the Doctor and his companions riding a triceratops and goofy robots) and the dark (the Doctor hastening the death of the pirate trader who had taken over the ship and killed most if its inhabitants.). But for me the dinosaurs stole the show. Why were Earthly dinosaurs on the spaceship? Because, in the Whoverse the Earth hosts another humanoid race besides Homo sapiens. There is also a lizard-like race called the Silurians or Homo reptilia, currently hibernating deep underground. But millions of years ago the Silurians had a technologically advanced societ among the dinosaurs. When the asteroid that caused the extinction of the dinosaurs was on a collision course with Earth, the Silurians filled a spaceship with dinosaurs and plants to rescue them. Thus dinosaurs on a spaceship. ... the unidentified “raptors” suffered the curse of the bunny hands and insufficient feathery coats. Filmmakers seem reluctant to drape feathers over dromaeosaurids, but, for any effects artists who may be reading, we know that these dinosaurs had exquisite plumage covering almost their entire body. If you’re going to have raptors, they should be intricately feathery. [...] You may want to laugh at a Deinonychus all puffed up, but that will be the last sound you ever make before it starts to eat you. I would go further than that. It was recently found that a distant cousin of Tyrannosaurus rex called Yutyrannus huali was covered with a downy coat of 6-8 inch long feathers over most of its body. That has lead to speculation that T. rex might have been feathered as well. Analysis of the fossilized feathers of the much smaller Sinosauropteryx lead to the discovery that the more than 120 million year old feathers contain melanosome cells that store either red or black pigments. The pattern of those pigment cells in the fossils suggest that Sinosauropteryx may have been striped, at least along its tail. So I'd propose putting those two findings together with a bit of artistic license, giving even the great T. rex on the spaceship colorfully patterned plumage. I think that would have looked awesome and have had the right mix of terror wrapped in whimsy to suit a Doctor Who episode. It also makes me think about how quickly science fiction stories can become outdated, even when they are set in the past. I'd guess that most of us have read or watched older science fiction stories where the "future" technology became obsolete long ago. The recent discoveries about dinosaur appearance are an example of how scientific progress can change how we view the past. Perhaps plain gray dinosaurs should go the way of telephone booths and horse-drawn carriages in SF. Apparently the idea of feathered dinosaurs apparently is quite upsetting to young-earth creationists, who don't like the way it supports the hypothesis that modern birds evolved from dinosaurs. Fiction that depicts prehistoric animals based on the most up-to-date fossil evidence not only has cool-looking creatures, but also helps promote science in general. Top image: Sinocalliopteryx gigas as a stealth hunter feeding on the dromaeosaur Sinornithosaurus. Illustration by Cheung Chungtat. From Xing L, Bell PR, Persons WS IV, Ji S, Miyashita T, et al. 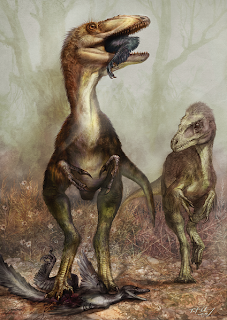 (2012) Abdominal Contents from Two Large Early Cretaceous Compsognathids (Dinosauria: Theropoda) Demonstrate Feeding on Confuciusornithids and Dromaeosaurids. PLoS ONE 7(8): e44012. doi:10.1371/journal.pone.0044012.g008. This file is licensed under the Creative Commons Attribution 2.5 Generic license. Bottom image: Cover of Analog Science Fact & Fiction February 1961. 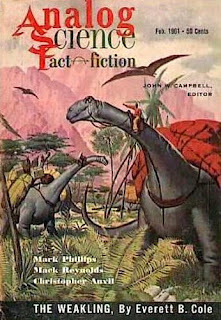 It illustrates "The Weakling" by Everett B. Cole, in which there are great "saurians" used as pack animals, meat and pets on an alternate (or future?) Earth. The story is heavily dependent on "psionics" and mind control as a plot device, if you like that sort of thing. The cover and story are available through Project Gutenburg, and are out of copyright. And while we're at it - why wouldn't there be feathered Silurians! Feathered Silurians would be fabulous!